A lot of discussion has happened on fintech in India and whether it can disrupt traditional financial institutions? Fintech, in India, is at a very nascent stage and not many are privy to either the products offered or the benefits associated to them. And it is to be seen as complimenting the existing financial institutions rather than disrupting them. One of the products of fintech is Peer to Peer lending (P2P lending). This is in simple form is a mechanism where the borrowers connect with the lenders to fulfil their loan requirements. The virtual market place where they meet is called a P2P lending platform. The role of the platform is to not only list the requirements and registers the borrowers and lenders, it also does the diligence on the borrowers. Some of the platforms like Rupaiya Exchange also assign an indicative credit rating to the borrowers based on the documents submitted, social profiling, and credit checks among others. So what's in for the users to register and list the requirements? And why should someone lend money to such borrowers? 1. Maximize returns/ better interest rates: typical rate of interest earned via such platforms is upwards of 15% and can touch upto 24% which post tax also is much higher than normal FDs and in some cases even stock market. 3. Credit checks: the lenders can conduct their own credit checks and ask questions from the borrowers via the platform; thereby not being dependent on any intermediary for conducting such checks. In addition, as mentioned above, some of the platforms also provide and assign credit ratings to the borrowers. 4. Choose your own investments: the lending platforms let you choose the borrowers and partly fund their requirement hence increasing the diversification and spreading the risks further. 6. Monthly repayments and fixed cash flows: the repayment of the amounts along with interest is done on a monthly basis and such repayments are monitored on regular basis thus ensuring regular flow of income. In global context, P2P lending is not new with players like Funding Circle, Lending Club, Zopa etc. already established in their respective geographies and credited for facilitating disbursement of millions of dollars on a yearly basis and some of them being listed on stock exchanges also. Of course like in any other investments, there is a risk associated to default, however with prudence and adequate diversification such risk can be covered if not mitigated to a 100%. Considering the pros of P2P lending it's about time when it is adopted by both lenders and borrowers here in India. Rohan Hazrati (@HazratiRohan) is the Founder of #Rupaiya Exchange. He has worked across geographies and in his last assignment was the CFO of a multibillion dollar enterprise. P2P Lending – An Opportunity for the Common Man! Mr. Talwar*, aged 57, is heading an NGO in Kolkata. The NGO has been established to serve juvenile delinquents and mentally challenged. Prior to this, Mr. Talwar was heading the Administrative Department of an MNC. Today Mr. Talwar is looking for a personal loan of Rs. 5 Lacs for his daughter’s wedding. Given his credentials and his professional career, Rs 5Lacs loan should not be an issue. However, there is one concern: Mr. Talwar is employed as a contractor/professional with the NGO and hence does not have salary slips to prove his income. Since his salary slips are missing, no bank is ready to lend money to Mr. Talwar. While some NBFCs are ready to work with him, the interest costs are high, discouraging him to enter into a contract with these institutions. Mr. Talwar while browsing through the internet refers to a P2P platform, RupaiyaExchange.com and registers himself as a borrower. Few questions from the Rupaiya Exchange team, due diligence of his documents and after a personalized phone call, Mr. Talwar is successfully approved as a Borrower on the platform. The above depicts the power of P2P lending, which helps professionals like Mr. Talwar break barriers created by typical financial institutions and a ‘checklist’ driven approach adopted by them. 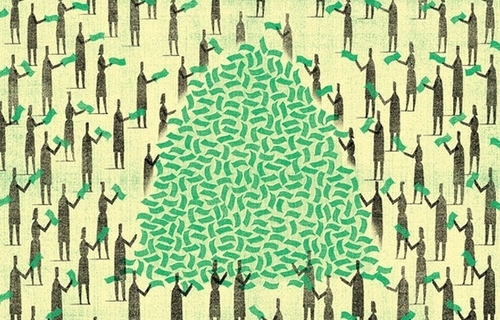 P2P Lending platforms are a reality and represent an Alternative Financing opportunity. This is an inclusive initiative for people with a sound track record, but are marred by the unavailability of one or more of ‘important documents’ or a ‘low credit’ score to qualify for the ‘right’ borrower. The P2P lending platforms devise their own approach (Rupaiya Exchange has a detailed in house credit check mechanism as well) to check the credentials of the proposed borrower and give them alternate ratings. Not to say that the P2P platforms do not reject borrowers or loan application; rejections do happen, however these are in cases where there are serious flaws in the credentials of the proposed borrower or loan listings and such reasons are explained to the borrowers in detail. The P2P lending scenario is already dominating the US and Europe economies with large players like Lending Club, Prosper, Zopa etc. established and flourishing and touching the lives of common individuals. In India, P2P lending is at a very nascent stage but with the right momentum and ability to solve problems of the common man, like Mr. Talwar, it has a huge opportunity to grow.